RD Richard Belding received a call to the staff duty phone at approximately 8:34pm from Resident Samuel “Screech” Powers. Resident Screech stated that he had recently come back from the local hangout known as “The Max,” and encountered Resident Zach Morris running through the lobby of Bayside Hall. Resident Screech reported that Resident Morris stated, “I’ve got to check on Jesse. She’s in trouble.” Resident Screech indicated that he and his friends were worried about Resident Jesse Spano because she had a number of high-profile midterms in the coming weeks and was also singing in a high-stakes concert that night. Resident A.C. Slater had also previously confronted Resident Spano about her use of caffeine pills, warning her that they can damage her health. RD Belding entered the room and was able to calm Resident Spano down. Resident Spano stated that she was a straight-A student and under so much pressure to perform and gain admittance to California University. Resident Spano had started taking caffeine pills this week and had taken nearly 10 that night alone. RD Belding called the Counselor-On-Duty who did an assessment of Resident Spano’s state of mind and determined she was not a harm to herself, but that Campus Police and an ambulance should be called to check Resident Spano’s vitals. EMTs declared that Resident Spano was safe to stay in her room provided she take no further caffeine pills. RD Belding confiscated the caffeine pills and Resident Morris stated he would stay with Resident Spano through the night until she fell asleep. 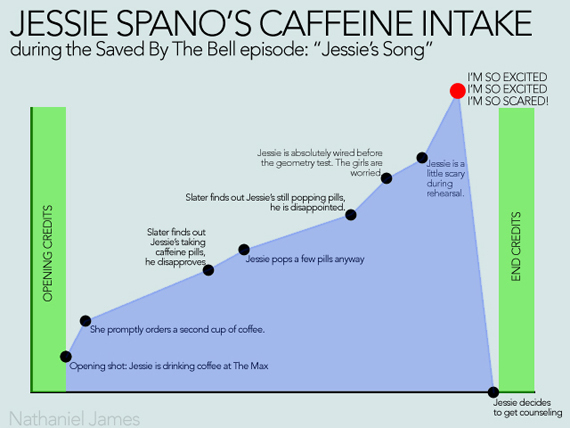 Follow Up: Jesse Spano should be added to our “students of concern” list for follow-up. Additionally, during the course of the incident, Resident Morris indicated that he was concerned that Resident Slater may be abusing drugs as well, particularly steroids. * Author’s Note: Although I present this in parody of a well-known over-acted scene from pop culture, prescription, alcohol and other drug abuse on campus is a serious problem that should not be made light of. If you know of someone who may be abusing alcohol or other drugs, seek resources and intervention to help that individual. Sharing widly. This is great.